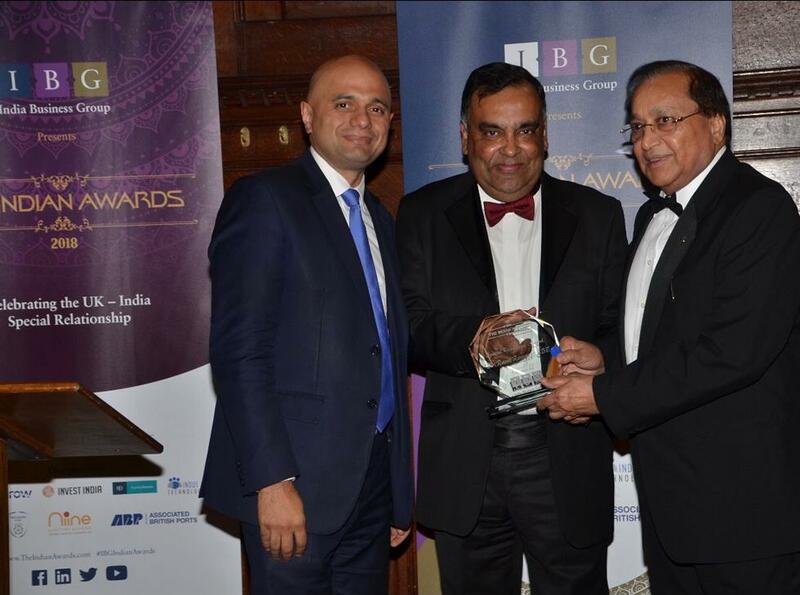 The second Indian Awards, organised by the India Business Group (IBG), a leading business advisory consultancy took place last night (17th May) in the Palace of Westminster. The awards, attended by UK Home Secretary, Rt Hon Sajid Javid MP, recognise UK-based individuals, businesses and organisations that have contributed to furthering the relationship culturally, socially or economically, between India and the UK. The Awards were founded by Amarjit Singh, Chief Executive Officer of the India Business Group (IBG), an established thought leader on UK-India business affairs and Special Advisor for India to the University of Southampton of which he is also a graduate. Following last month’s successful UK visit of Prime Minister Narendra Modi, the gala invitation-only dinner and ceremony featured senior business leaders, Government officials, opinion formers and prominent members of the Indian community and guests from India and other parts of the World. Nominations were invited by members of the public and the handful of winners were chosen by a panel of esteemed judges and announced on the evening. This year’s Special Recognition Award, which applauds ‘an individual’s outstanding commitment to building UK-India relations’, was presented to Dr Rami Ranger CBE, Chairman of Sun Mark Limited. On receiving the Special Recognition Award, Dr Ranger said: “It is a great honour to receive this special recognition award from the India Business Group. I am grateful to the judges who considered me worthy of this accolade. I am privileged to receive the award as last year the same recognition was bestowed upon my hero, the Former Prime Minster of the UK, The Rt. Hon. David Cameron. This award also represents India’s emerging stature and standing in the world as a positive economic and political force. The partnership between India and Britain is based on similar values and as a result, it will go from strength to strength”. “As Home Secretary, I am delighted to be able to attend the 2018 Indian Awards ceremony, which recognises outstanding contributions to the UK-India relationship. The UK is one of the world’s oldest democracies, and India the largest. Our collaboration is a force for good – our shared values magnified by the ‘living bridge’ formed of a breadth of personal, professional, cultural and institutional ties. With so much in common, it’s only natural that Britain and India continue working together to make our people, and the world, safer and more prosperous”. The Awards ceremony was supported by a range of high profile partners, including Associated British Ports, Heathrow Airport, Invest India, the Institute of Directors Hampshire Cricket, the Lalit Hotel, Niine and Star TV Networks was the official media partner. The awards were also supported by Indus Net Techshu, Chivas Brothers, HCL, Here&Now365 and Taylor Wessing. The esteemed judging panel was made of up senior figures, including: Lord Patel of Bradford OBE, Chair of IBG, Virendra Sharma MP, Chair of the Indo-British APPG, Baroness Prashar CBE, Deputy Chair of the British Council, Rajiv Luthra, Founder and Managing Partner of Luthra & Luthra Law Advocates, Dr Catherine Raines, Former Director General of Department for International Trade, and Alan Fitzwater, Director of Regional Engagement at the Institute of Directors. “The Indian Awards is an important UK wide initiative for recognising entrepreneurs, inspirational people and organisations that have championed international cooperation between the UK and India. This is an opportune moment to celebrate the dynamic UK-India partnership”. 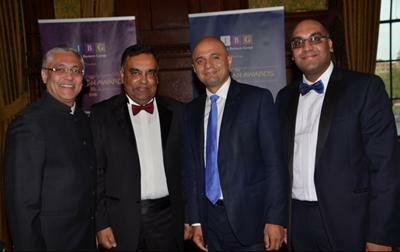 Winner of the Special Recognition Award - Dr Rami Ranger OBE (far right), Home Secretary, Sajid Javid (far left); and HE Y K Sinha, High Commissioner (centre). 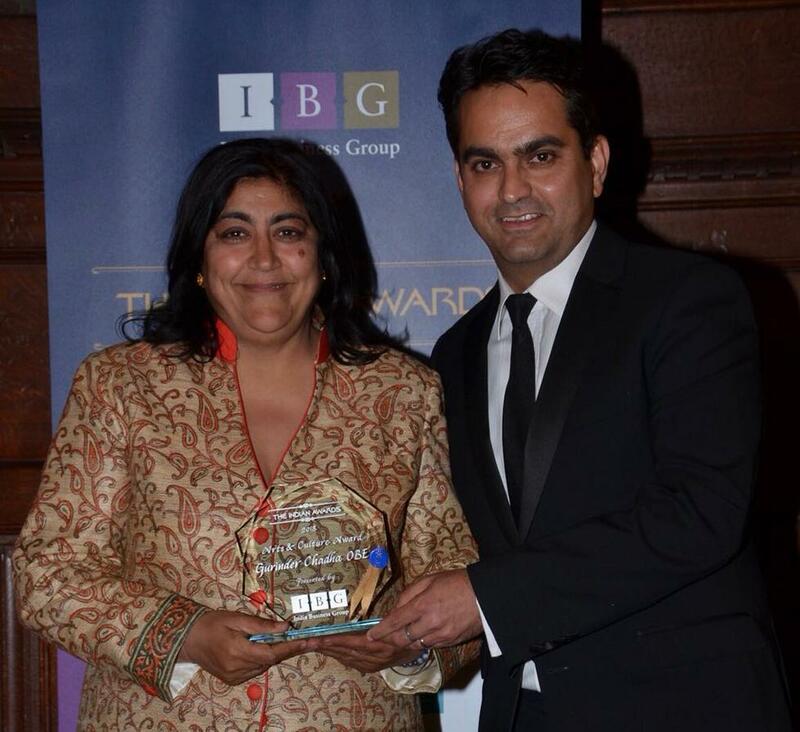 Winner of the Arts & Culture Award - Gurinder Chadha OBE.